Published by Leo Cooper, Pen & Sword Books Ltd.
Price £25.00, 2001, 366 pages. Gregory Michno was born in Detroit in 1948. His father was a submariner in World War II aboard the USS Pampanito, one of the many submarines, which hunted in packs in the seas around south east Asia, and which sunk many Japanese ships carrying POWs. This well researched and documented book is crammed with personal accounts of the many movements of POWs to meet the Japanese demand for slave labour as they advanced through south east Asia, the conflicting calls from Japan to replace men enlisted into the ever increasing armed forces. It is not a book for the squeamish for many of the accounts of the conditions in which men were transported, and their efforts to survive, are truly harrowing. Underlying this story of unrelenting horror, which some have said is too terrible for a book, is the recent revelation that the Allies had, in the spring of 1943, cracked the code used by the Japanese when signalling ship movements. Thereafter everything the Allies needed to know about ships' times, routes and cargoes was passed to the submarines hunting them. Not surprisingly increased dramatically through 1943 and 1944 and though hard pressed shipyards added 465,000 tons to the fleet, losses of 1,809,000 tons reduced the total tonnage at sea to 1,466,000, 23% of what the Japanese had started the war with. In the process America lost more POWs by 'friendly fire' than in the battle for Okinawa the bloodiest of all Pacific battles. This book is a reminder of the number of other nationalities, including civilians, who suffered at the hands of the Japanese. The detail and human stories it provides complement the essential facts of Van Waterford's book Prisoners of the Japanese in World War II. In the latter for example the last draft from Hong Kong to Japan is recorded as a single journey of just 6 days. It was however a 17 days three leg marathon as one clapped out hulk was exchanged another at Formosa and patched up in Shanghai. 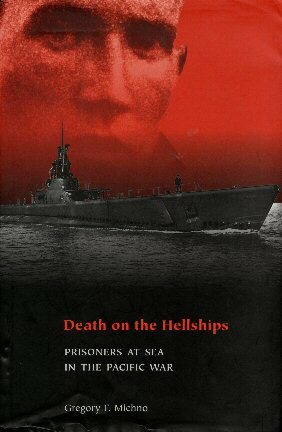 For any research into the war in the Pacific this is a valuable companion to Van Waterford. It has an equally extensive list of references and bibliography. It can be ordered through local libraries. There is a copy in the Luton Library.